Beatriz Williams teams up with Karen White and Lauren Willig for a three-generational saga of love lost and found. and if you enjoy a good character and plot-driven romantic page turner, this book is for you. 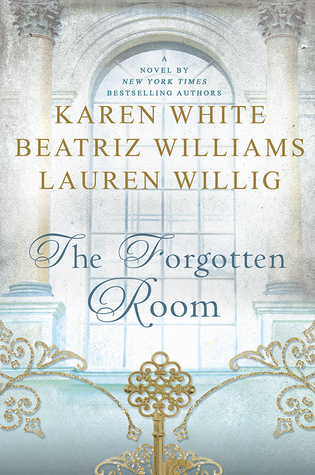 Beatriz Williams and company weave a web of romance, mystery, and suspense encompassing three generations and a single room in a New York Gilded Age mansion, and it’s enough to keep you up at night hoping for the best, fearing the worst. When Kate Schuyler, the only female doctor in a former-mansion hospital in New York, encounters the handsome (and wounded, she’s doomed) Captain Cooper Ravenel during World War II, she discovers he possesses a miniature portrait that looks just like her. Together, they’re drawn into a mystery reaching back three generations, from herself to her Jazz Age mother in search of her own father, to a Gilded Age servant in the house in which the mystery began. Unfolding in three parts from three great authors, The Forgotten Room is an excellent escape into romantic suspense. Loved this book Erin! I’d give it 5 stars but I’m not the literary snob you are 🙂 (and I mean that with the most respect).